This challenge closed over 7 years ago. Beings can cover animals, people, monsters, dragons, fairies just some kind of being from a parallel world. I will apply for a $20 redbubble voucher for the winner. The top three will be featured. The top three winning entries must be submitted to the group so they can be featured. 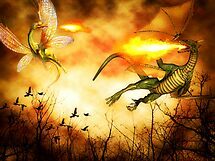 Dragon's Rage by shutterbug2010 was voted the most popular entry in this challenge with 5 votes.